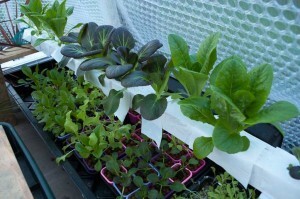 We are currently growing vegetable plants in two greenhouses. One is a traditional glass greenhouse, This is in my parents garden. The other greenhouse in our own garden is a new polycarbonate plastic one. The reason we have this type is because we live near a playing field and we didn’t like the thought of a football smashing the glass every other week, Also we have two young children who play near the greenhouse. A consequence of having two different types is that we can find out which plants appear to like growing inside different types of greenhouses. Inside the glass greenhouse it gets very hot as it get’s full sunlight, Whereas the plastic greenhouse keeps relatively cool and due to the polycarbonate the sunlight is diffused. 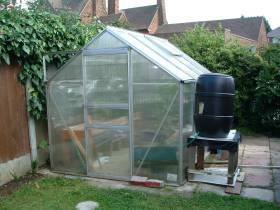 On this page you can see details of the plastic greenhouse we have in our garden, And the different types of hydroponics systems we are using within it. After trying different configurations of plants, We are now concentrating this greenhouse on mostly cucumber production as they seem to prefer growing in the slightly cooler diffused light. (Although this seems to contradict certain books I’ve read on this), We do though have one tomato plant and a Aubergine plant growing inside. 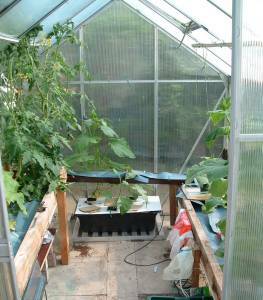 The green house consists of two main NFT channels along each side, Nutrient solution from a holding tank is pumped up to the first channel on the left hand side of the greenhouse. This then flows past the roots of the plants and falls into a piece of guttering at the end of the greenhouse. This then flows across into the second NFT channel where it flows back down into the holding tank.